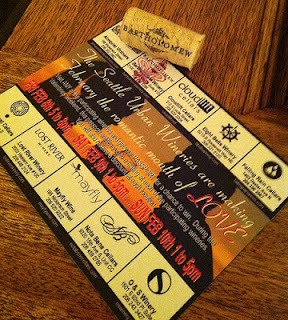 The Seattle Urban Wineries are sponsoring a Passport to Wine, Chocolate and Love to promote the exploration of their collective of Seattle Wineries in February. The event kicked off this past weekend with most of the participating wineries hosting Wine & Chocolate events. I had the opportunity to visit many of the Wineries located in the South end of Town. Bartholomew Wine and Tease Chocolates. The 2009 Tempranillo’s dark berries and barrel spices paired nicely with the Spicy Mayan chocolate’s cinnamon notes. As a bonus, the 2009 Malbec stood on its own featuring black cherry, toffee and chocolate notes along with nice hints of clove. Nota Bene provided a variety of chocolates to try with an extensive lineup of their Bordeaux and Rhone inspired wines. The 2008 Dineen blend of Cabernet Sauvignon and Cabernet Franc featured dark cherry, espresso bean and a nice tart finish that worked well with a creamy Lindal milk chocolate truffle. Laurelhurst and Yukon Jackson. The El Humidor 2009 Petite Sirah seems to be hitting its stride after about 4 months in bottle. Living up to the El Humidor moniker, there are loads of blue fruits, cedar, menthol and white pepper all leading to a dry finish. The cedar spiciness went exceptionally well with the caramel in the Yukon Jackson chile turtle. 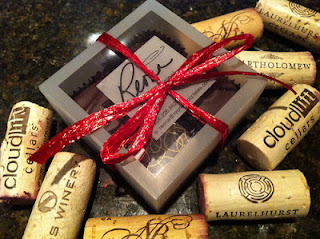 Cloudlift cellars featured three different hand made truffles from Reona Chocolates including one that was infused with Cloudlift’s Cloud 2 Merlot dominant Bordeaux style blend. My favorite was the 2009 Panorama that is 56% Merlot and the remainder a mix of Cabernet Sauvignon and Cabernet Franc. The notes of cherry and dry light white pepper went very well with the smooth creaminess of the Mocha truffle. Stottle winery recently opened their West Seattle tasting room on Harbor Avenue. This was my first opportunity to meet Josh and taste through his wines. Josh is inspired by food friendly Italian wines. He has three locations where you can sample his offerings: the winery in Lacey, a tasting room in Hoodsport and the Harbor Avenue location. The 2009 Barbera went well with dark chocolate. The notes of cherry and savory brambles give way to a nice dry spicy finish that seemed like a match made in heaven for the dark chocolate’s sultriness. There are two weekends left in the month and many of the wineries are open on Saturdays and Sundays. If you are in Seattle and looking for something to do you should really get out and explore these great wineries. They are making some great wines right here in our own backyard!